Yu the Great (Chinese: 大禹; pinyin: Dà Yǔ, c. 2200 – 2101 BC) was a legendary ruler in ancient China famed for his introduction of flood control, inaugurating dynastic rule in China by founding the Xia Dynasty, and for his upright moral character. The dates proposed for Yu's reign predate the oldest known written records in China, the oracle bones of the late Shang dynasty, by nearly a millennium. No inscriptions on artifacts from the proposed era of Yu, nor the later oracle bones, make any mention of Yu; he does not appear in inscriptions until vessels dating to the Western Zhou period (c. 1045–771 BC). The lack of anything remotely close to contemporary documentary evidence has led to some controversy over the historicity of Yu. Proponents of the historicity of Yu theorise that stories about his life and reign were transmitted orally in various areas of China until they were recorded in the Zhou dynasty, while opponents believe the figure existed in legend in a different form - as a god or mythical animal - in the Xia dynasty, and morphed into a human figure by the start of the Zhou dynasty. Many of the stories about Yu were collected in Sima Qian's famous Records of the Grand Historian. Yu and other "sage-kings" of Ancient China were lauded for their virtues and morals by Confucius and other Chinese teachers. Yu is one of the few Chinese rulers posthumously honored with the epithet "the Great". According to several ancient Chinese records, Yu was the 8th great-grandson of the Yellow Emperor: Yu's father, Gun, was the 5th great-grandson of Emperor Zhuanxu; Zhuanxu's father, Changyi, was the second son of the Yellow Emperor. Yu was said to have been born at Mount Wen (汶山), in modern-day Beichuan County, Sichuan Province, though there are debates as to whether he was born in Shifang instead. Yu's mother was of the Youxin clan named either Nüzhi (女志) or Nüxi (女嬉). When Yu was a child, his father Gun moved the people east toward the Central Plain. King Yao enfeoffed Gun as lord of Chong, usually identified as the middle peak of Mount Song. Yu is thus believed to have grown up on the slopes of Mount Song, just south of the Yellow River. He later married a woman from Mount Tu (Chinese: 塗山) who is generally referred to as Tushan-shi (塗山氏; "Lady Tushan"). They had a son named Qi, a name literally meaning "revelation". The location of Mount Tu has always been disputed. The two most probable locations are Mount Tu in Anhui Province and the Tu Peak of the Southern Mountain in Chongqing Municipality. 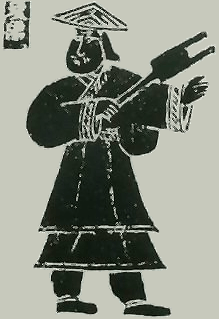 Han Dynasty depiction of Yu. During the reign of king Yao, the Chinese heartland was frequently plagued by floods that prevented further economic and social development. Yu's father, Gun, was tasked with devising a system to control the flooding. He spent more than nine years building a series of dikes and dams along the riverbanks, but all of this was ineffective, despite (or because of) the great number and size of these dikes and the use of a special self-expanding soil. As an adult, Yu continued his father's work and made a careful study of the river systems in an attempt to learn why his father's great efforts had failed. Collaborating with Houji, a semi-mythical agricultural master about whom little is concretely known, Yu successfully devised a system of flood controls that were crucial in establishing the prosperity of the Chinese heartland. Instead of directly damming the rivers' flow, Yu made a system of irrigation canals which relieved floodwater into fields, as well as spending great effort dredging the riverbeds. Yu is said to have eaten and slept with the common workers and spent most of his time personally assisting the work of dredging the silty beds of the rivers for the thirteen years the projects took to complete. The dredging and irrigation were successful, and allowed ancient Chinese culture to flourish along the Yellow River, Wei River, and other waterways of the Chinese heartland. The project earned Yu renown throughout Chinese history, and is referred to in Chinese history as "Great Yu Controls the Waters" (Chinese: 大禹治水; pinyin: Dà Yǔ Zhì Shuǐ). In particular, Mount Longmen along the Yellow River had a very narrow channel which blocked water from flowing freely east toward the ocean. Yu is said to have brought a large number of workers to open up this channel, which has been known ever since as "Yu's Gateway" (Chinese: 禹門口). In a mythical version of this story, presented in Wang Jia's 4th century AD work Shi Yi Ji, Yu is assisted in his work by a yellow dragon and a black turtle (not necessarily related to the Black Tortoise of Chinese mythology). Another local myth says that Yu created the Sanmenxia "Three Passes Gorge" of the Yangzi River by cutting a mountain ridge with a divine battle-axe to control flooding. Traditional stories say that Yu sacrificed a great deal of his body to control the floods. For example, his hands were said to be thickly callused, and his feet were completely covered with callus. In one common story, Yu had only been married four days when he was given the task of fighting the flood. He said goodbye to his wife, saying that he did not know when he would return. During the thirteen years of flooding, he passed by his own family's doorstep three times, but each time he did not return inside his own home. The first time he passed, he heard that his wife was in labor. The second time he passed by, his son could already call out to his father. His family urged him to return home, but he said it was impossible as the flood was still going on. The third time Yu was passing by, his son was older than ten years old. Each time, Yu refused to go in the door, saying that as the flood was rendering countless number of people homeless, he could not rest. Yu supposedly killed Gong Gong's minister Xiangliu, a nine-headed snake monster. King Shun, who reigned after Yao, was so impressed by Yu's engineering work and diligence that he passed the throne to Yu instead of to his own son. Yu is said to have initially declined the throne, but was so popular with other local lords and chiefs that he agreed to become the new emperor, at the age of fifty-three. He established a capital at Anyi (Chinese: 安邑), the ruins of which are in modern Xia County in southern Shanxi Province, and founded what would be called the Xia Dynasty, traditionally considered China's first dynasty. Yu's flood control work is said to have made him intimately familiar with all regions of what was then Han Chinese territory. According to his Yu Gong treatise in the Book of Documents, Yu divided the Chinese "world" into nine zhou or provinces. These were Jizhou (冀州), Yanzhou (兗州), Qingzhou (青州), Xuzhou (徐州), Yangzhou (揚州), Jingzhou (荊州), Yuzhou (豫州), Liangzhou (梁州) and Yongzhou (雍州). According to the Rites of Zhou there was no Xuzhou or Liangzhou, instead there were Youzhou (幽州) and Bingzhou (并州), but according to the Erya there was no Qingzhou or Liangzhou, instead there was Youzhou (幽州) and Yingzhou (營州). Either way there were nine divisions. Once he had received bronze from these nine territories, he created ding vessels called the Nine Tripod Cauldrons. Yu then established his capital at Yang City (陽城). According to the Bamboo Annals, Yu killed one of the northern leaders, Fangfeng (防風) to reinforce his hold on the throne. According to the Bamboo Annals, Yu ruled the Xia Dynasty for forty-five years and, according to Yue Jueshu (越絕書), he died from an illness. It is said that he died at Mount Kuaiji, south of present-day Shaoxing, while on a hunting tour to the eastern frontier of his empire, and was buried there. The Yu mausoleum (大禹陵) known today was first built in the 6th century CE (Southern and Northern Dynasties period) in his honor. It is located four kilometers southeast of Shaoxing city. Most of the structure was rebuilt many times in later periods. The three main parts of the mausoleum are the Yu tomb (禹陵), temple (禹廟) and memorial (禹祠). In many statues he is seen carrying an ancient hoe (耒耜). A number of emperors in imperial times travelled there to perform ceremonies in his honor, notably Qin Shi Huang. Because no documentary evidence about Yu survives, there is some controversy as to the historicity of the figure. No inscriptions on artifacts dated to the supposed era of Yu, or the later oracle bones, contain any mention of Yu. The first archeological evidence of Yu comes from vessels made about a thousand years later, during the Western Zhou dynasty. The Doubting Antiquity School of early 20th century historians, for example, theorised that Yu was not a person in the earliest legends, but a god or mythical animal, who was connected with water and possibly with the mythical Dragon Kings and their control over water. According to this theory, Yu (as god or animal) was represented on ceremonial bronzeware by the early Xia people, and by the start of the Zhou Dynasty, the legendary figure had morphed into the first man, who could control water, and it was only during the Zhou Dynasty that the legendary figures that now precede Yu were added to the orthodox legendary lineage. According to the Chinese legend Yu the Great was a man-god. Archaeological evidence of a large outburst flood on the Yellow River has been dated to about 1920 BCE. This coincides with new cultures all along the Yellow River. The water control problems after the initial flooding could plausibly have lasted for some twenty years. Wu et al suggest that this supports the idea that the stories of Yu the Great may have originated from a historical person. 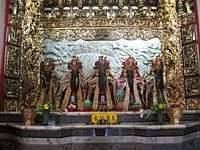 Yu and his fellow kings of the water immortals in a shrine at the Anping Tianhou Temple in Tainan on Taiwan. Yu was long regarded as a ideal ruler and kind of philosopher-king by the ancient Chinese. Beichuan, Wenchuan, and Dujiangyan in Sichuan have all made claims to be the birthplace of his birthplace. Owing to his involvement in China's mythical Great Flood, Yu also came to be regarded as a water deity in Taoism and the Chinese folk religions. He is the head of the Five Kings of the Water Immortals honored in shrines in Mazu temples as protectors of ships in transit. Wikimedia Commons has media related to Yu the Great. ↑ 戴逸, 龔書鐸. (2003) 中國通史. 史前 夏 商 西周. Intelligence press. ISBN 962-8792-80-6. p 36. 1 2 3 戴逸, 龔書鐸. (2003) 中國通史. 史前 夏 商 西周. Intelligence press. ISBN 962-8792-80-6. p 38. ↑ Zynews.com. "Zynews.com." Xia dynasty brief history. Retrieved on 2010-09-18. ↑ Scta.gov.cn. "Scta.gov.cn." (Chinese) Retrieved on 2010-09-18. ↑ Hubeiwater.gov.cn. Hubeiwater.gov.cn 大禹三过家门而不入与洪湖抗洪十字歌的精神浅谈. (Chinese). Retrieved on 2010-09-18. 1 2 3 Wang Hengwei 王恆偉. (2006) Zhongguo Lishi Jiangtang 中國歷史講堂 #1 Yuan Gu Zhi Chunqiu 遠古至春秋. Zhonghua Shuju 中華書局. ISBN 962-8885-24-3. p 18. ↑ Lu, Xing. Rhetoric in ancient China, fifth to third century, B.C.E. : a comparison with classical Greek rhetoric. (1998). Univ of South Carolina Press publishing. ISBN 1-57003-216-5, ISBN 978-1-57003-216-5. p 46–47. ↑ Lewis, Mark Edward (2006), The flood myths of early China, SUNY series in Chinese philosophy and culture, SUNY Press, pp. 104–105, 191–192, ISBN 0-7914-6663-9 (especially, notes 90 and 97). The relevant text is in Shi Yi Ji, Chapter 2: "黃龍曳尾於前，玄龜負青泥於後", etc. ↑ Destguides.com. "Destguides.com." Sanmenxia. Retrieved on 2010-09-26. ↑ 王恆偉. (2005) (2006) 中國歷史講堂 #1 遠古至春秋. 中華書局. ISBN 962-8885-24-3. p 19. 1 2 Ng Saam-sing 吾三省. (2008). Zong-guok Man-faa Bui-ging Bat-cin Ci 中國文化背景八千詞. Hong Kong: Seong Mou Jan Syu Gwun 商務印書館(香港). ISBN 962-07-1846-1, ISBN 978-962-07-1846-5. p 37. ↑ Bjaaland Welch, Patricia. (2008). Chinese art: a guide to motifs and visual imagery. Tuttle Publishing. ISBN 0-8048-3864-X, 9780804838641. p 262. ↑ 李玉潔. (2003). 中國早期國家性質. 知書房出版集團. ISBN 986-7938-17-8, ISBN 978-986-7938-17-6. ↑ 王仲孚. (1996). 中國上古史專題研究. 五南圖書出版股份有限公司. ISBN 957-11-1290-9, ISBN 978-957-11-1290-9. p 392. 1 2 Chinaculture.org. "Chinaculture.org." 大禹祭典. Retrieved on 2010-09-26. 1 2 China.org.cn. "China.org.cn." Yu Mausoleum. Retrieved on 2010-09-26. ↑ lvyou.eco.gov.cn. "lvyou.eco.gov.cn." 治水英雄大禹的葬地：大禹陵. Retrieved on 2010-09-26. ↑ "Shuexian Dieties", Official site, Tainan: Grand Matsu Temple, 2007 .